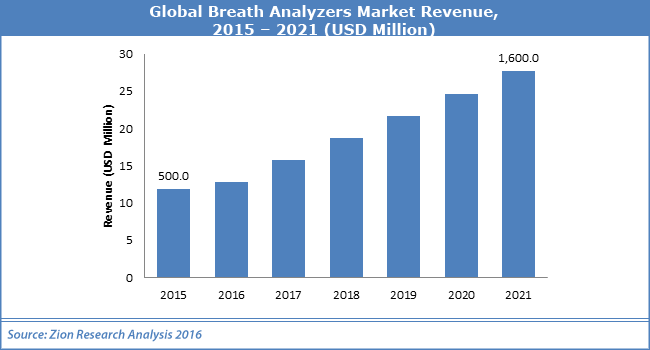 With the presence of a large pool of participants, the global breath analyzer market is displaying a highly competitive business landscape, finds a new research report by Zion Market Research (ZMR). Alcohol Countermeasure Systems Corporation, Lifeloc Technologies, Drägerwerk AG, and Quest Products Inc. are some of the key vendors of breath analyzers across the world. These players across breath analyzer market are focusing aggressively on innovation, as well as on including advanced technologies in their existing products. Over the coming years, they are also expected to take up partnerships and mergers and acquisitions as their key growth strategy across breath analyzer market, states the study. Citing an instance, in August 2018, Hound Labs, a scientific research & device firm based in California, has developed a marijuana & alcohol breath analyzer, which is world’s first breath analyzer that can accurately, quickly, and cost-effectively determine the presence of alcohol & marijuana in the breath of the person. The strategic move is predicted to stimulate breath analyzer market growth in the future. As estimated in this report, the global breath analyzer market stood at US$ 500 million in 2015. Witnessing a tremendous rise during the period from 2015 to 2021, the revenue in the breath analyzer market is expected to reach US$ 1600 million by the end of the forecast period. “Rise in consumption of alcohol and drug abuse along with stringent government legislations is likely to drive worldwide breath analyzer market trends,” says the author of this study. Apart from this, burgeoning product demand across healthcare sector for disease detection will further support the breath analyzer market growth notably over the years ahead. Police personnel make use of breath analyzers at traffic signals to determine whether the driver is driving the vehicle under the influence of alcohol or not. This has further influenced the growth of breath analyzer market. Low accuracy rate of breath analyzers and unhygienic conditions resulting in hospital acquired infections in patients, however, are predicted to hinder the expansion of breath analyzer market over the coming years. Nevertheless, the current research & development activities leading to product innovation will lead to a high demand for breath analyzers over a couple of years, normalizing the impact of hindrances on the breath analyzer market, reports the study. Geographically, North America has been leading the worldwide breath analyzers market and is anticipated to continue on its dominant position in the years to come, states the market study. Strict government regulations are projected to boost the product demand across the region. The presence of well-established medical & healthcare infrastructure facilities and skilled healthcare service providers is the main factor behind the dominance of the North America breath analyzer market. The large number of market players being headquartered in North America is another significant factor that is promoting the growth of the breath analyzer market in the region.